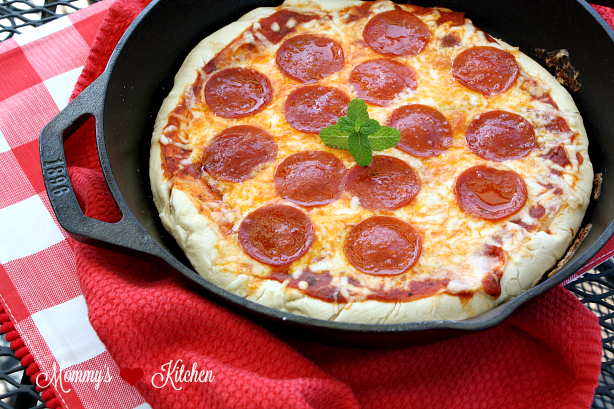 No need to heat up the house with this easy Stove Top Skillet Pizza. You can have dinner from stove to table in 30 minutes. Pizza is one of those meals that will pretty much please everyone! I make homemade pizza year round, but during the summer it can sometimes be a bit of a challenge. We don't dare crank up the oven, so most times my husband and I just grill our pizza outside, especially if we're feeding a crowd. We live in Texas and our summers are definitely hot and humid, so I really don't like standing outside in 100+ degrees, dripping with sweat assembling pizzas. Making homemade pizza should be a simple and not time consuming or complicated. 12 - inch Lodge Cast Iron Dual Handle Pan. This dual handle pan is new to my collection, but no worries because it came pre-seasoned and ready to use. I've been cooking with Lodge cast iron for as long as I can remember. My mother cooked with it, so that's how I was taught. I have included just a few of my favorite pieces below. 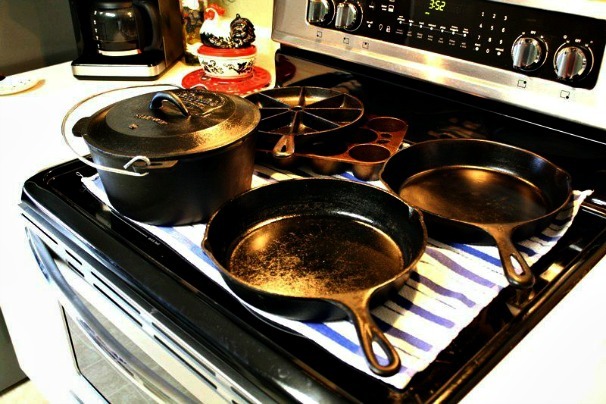 Lodge cast iron cookware is also made in the USA and really easy to clean! Just hand wash (with mild soap), dry promptly, rub with oil and store. As you can see I have a glass-top stove and I use my cast iron pans on my stove top all the time. Just take care not to drop the pan or slide it across the glass surface. 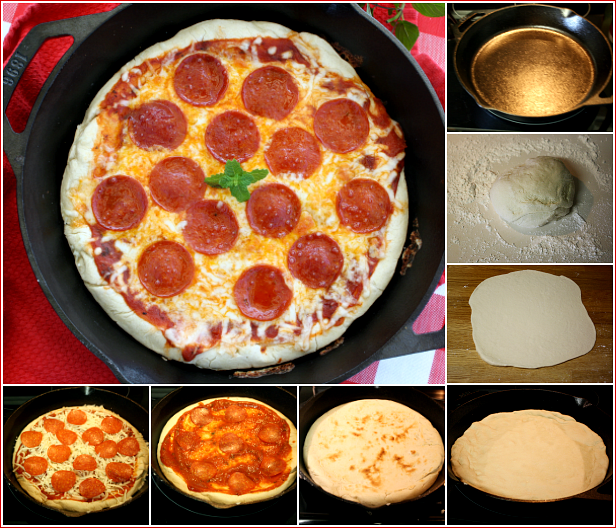 I have included step-by-step photos to show you how easily this skillet pizza came together. For more of a traditional oven-baked pizza and (to brown the crust edges), you can put the pizza under the ovens broiler for a minute or two once the pizza is cooked. I ❤ how easily this dual handle pan is to hold and goes from stove top to oven in a snap. I'm still amazed every time I make this pizza at just how easy the whole process is. If you make this recipe stop back by and let me know how you liked it! Happy pizza making!!!!! First prepare the pizza dough according to the recipe (cut in the ingredients in half if just making one pizza) and set aside. Place the cast iron pan on the stove top over medium-high heat. While the pan is warming get all your toppings ready so they're easy to grab when it comes time to assemble the pizza. On a floured surface, roll the pizza dough out into a 10 inch circle about 1/4 inch thick. Drizzle about 1/2 teaspoon of olive oil in the cast iron pan and wipe with a paper towel to spread the oil. Transfer the pizza dough to the pan and cook for about 1-2 minutes or until bubbles start to form on top and the crust is golden brown and crispy on the bottom. Flip the pizza crust over using a spatula and quickly add about 2-3 spoons of pizza sauce, desired toppings and cheese. Reduce the heat to medium and cover the pan, so the cheese melts and the toppings warm through. If you want a crispier pizza crust around the edges, place the dual handle pan under your oven broiler for a few minutes. Watch pizza carefully. Transfer pizza to a cutting board, cool, slice and serve. Cooks Note: One full recipe of the pizza dough will make two medium size skillet pizzas. Also it's better to use block style cheese for this recipe because it melts better than packaged shredded cheese that has a coating. Have been wanting to get a dual handle skillet; but seems like the cast iron is getting heavier and heavier for me to handle but doesn't stop me from using my C.I.S. OR stopping me from making this pizza. Thanks 4 sharing the recipe. It's picture perfect. I don't believe we have a dual handle pan but I know we need one. We have just one good skillet but a lot more reasons than one to use it. My son loves pepperoni pizza and so do I. And everyone here thinks that homemade pizza is the best!! Looks like the perfect pizza to me. My kids LOVE pizza. we have it at least once a week. We love making our own so this would be a great way to enjoy it a new way. YUM! These skillet recipes look so cool. For some reason the skillet scares me. I love pizza thought so I might just try out this recipe! 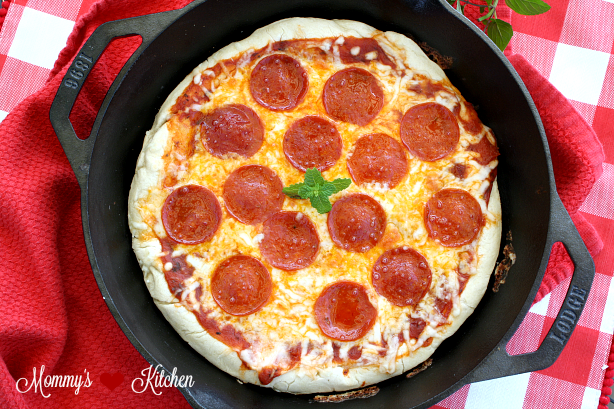 Wow, so funny to see this post because just this past weekend my husband promised the kids he would make his signature deep dish pizza in our cast iron skillet. He's been making them for years and I love those skillets! Your pizza look so delicious! 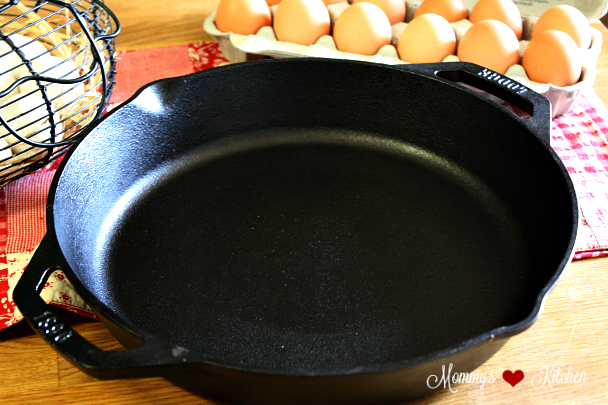 I am in the market for another skillet like this one you are using. My old one got used a few too many times but I love eating a good pizza in one of these. I will have to try your recipe once I get the pan. Thanks for sharing, it looks really yummmy! Now this is inventive. 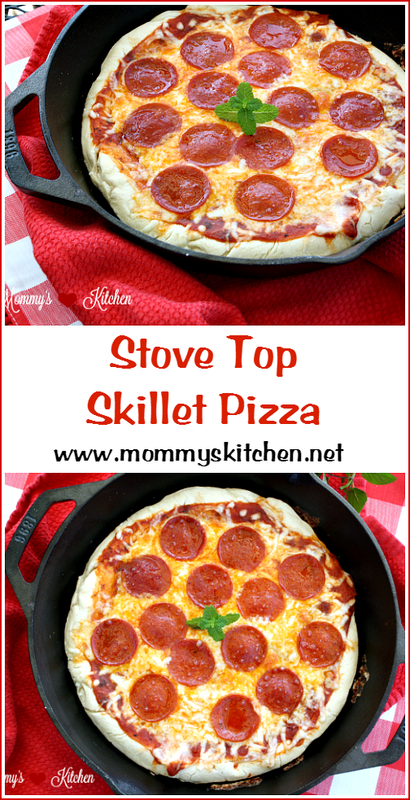 Skillet pizza sound great. I would love to try it this way in the future. Okay so first off this pizza looks great. My kids adore pizza. It is their favourite food ever. And it looks easy too. Not even kidding when I tell you that I have no skillet at all. None. I need a skillet badly and have been hunting for one at a good price. But I have not yet found one. I am now going to check out this brand Lodge that you mentioned. Thanks so much! Pizza on the stovetop? No way! I just told my husband about this and he looked at me like I was crazy. I will have to make it now. Made my 1st skillet pizza yesterday. Easy, peasy and Delicious. I did put mine in the oven; under the broiler for just a minute or 2. Was so good; making another one later today. This is so cool to have I have seen this in a local restaurant here in Tennessee. They serve home cooked meal very tasty. I believe this is heavy pan right? I've been wanting to buy one of this your pizza look perfectly done. My husband would be thrilled on this pan as he loves pizza.